For a beer lover, there is nothing better than a beautifully presented beer gift. 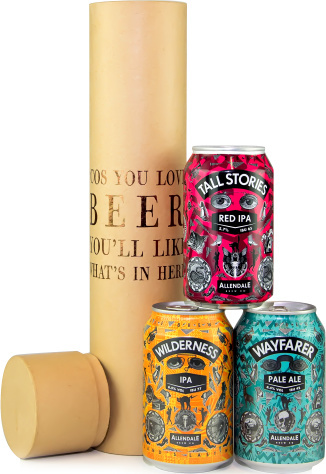 Our 3 Beers for Dad gift includes 3 craft beers carefully packed inside a gift tube with the message "Cos you love beer you'll like what's in here”. These IPA Ales from Allendale Brewery will give Dad the amazing opportunity to expand his beer tasting experience by trying some of the finest craft beers on the market.